My human found out that there is a photo of me and her in the May issue of Catster (on the events page, about the Cat Writers Conference). So we took a quick trip to the pet store to grab a copy. Unfortunately, they didn’t have any magazines there! And much to my human’s disappointment, there weren’t any outfits that she thought would flatter me. I didn’t care about any of that. 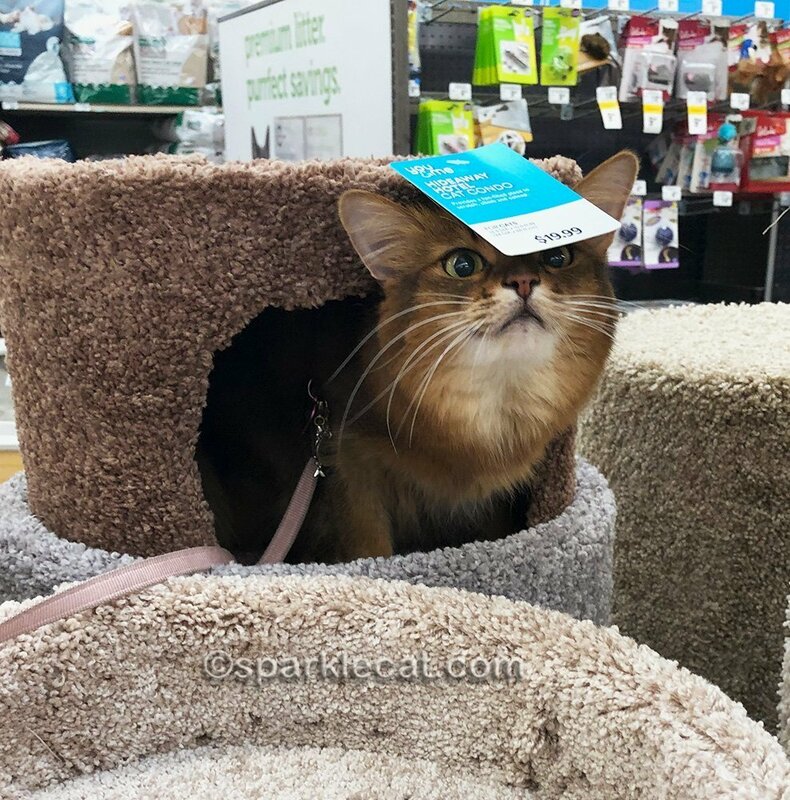 Or at least I didn’t when we got to the cat tree section! 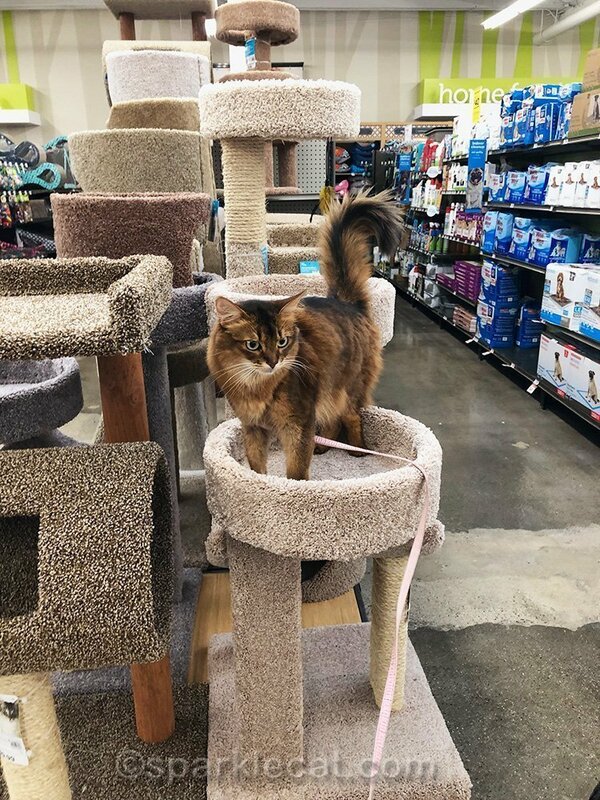 I got to play around with the cat trees for a few minutes before my human said we needed to pick up some cat food. Seriously, I could have stayed here all day. In the middle of getting the food, we stopped by the parakeets. They barely acknowledged my presence! Can you believe it? Didn’t they realize I’m a popular kitty on Instagram? 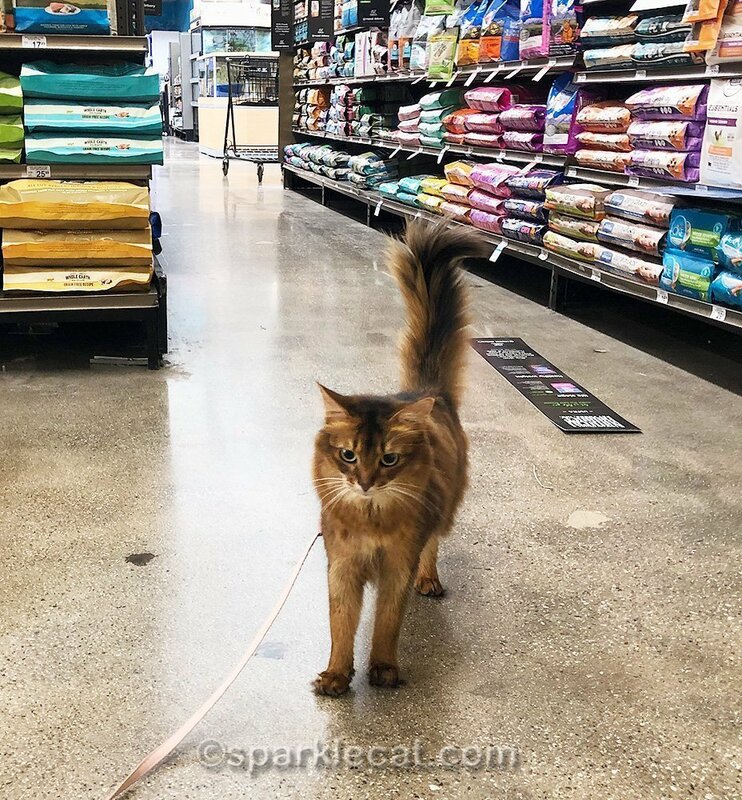 While we were in the cat section, my human let me down to walk up and down the aisles! That was fun, and I got lots of attention for being well behaved and well trained. All too soon, it was time to leave. 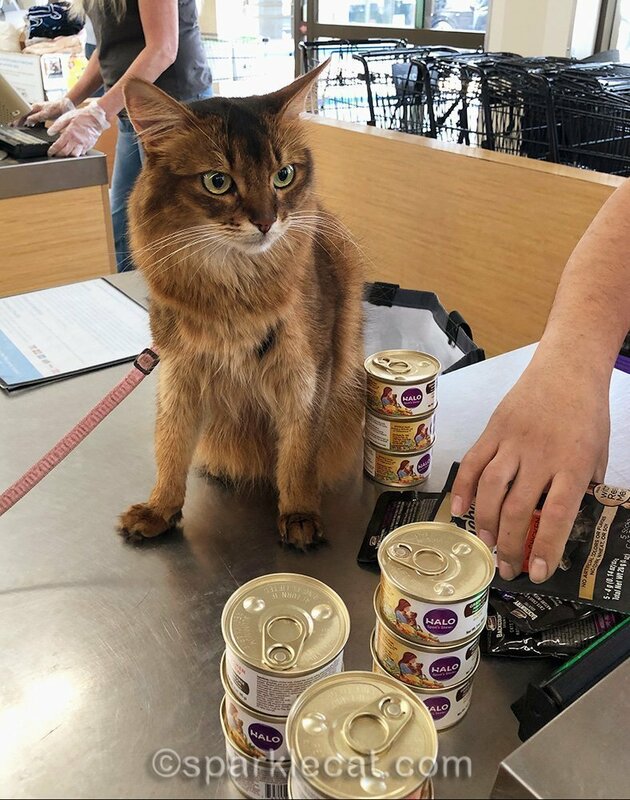 I supervised while the store worker checked us out. After all, I am a shopping pro by now! Those birdies are oblivious to lots of things. But surely they’d recognize a star when they saw one. They must’ve been napping. Tee hee hee. It looks like you had fun at the pet shop, Summer! Sorry your mum couldn’t buy a magazine there, though. Maybe another store will have some. You were very brave to walk around the store, Summer. In most of the big chain pet stores in our area, many of the dog owners do not keep their dogs under control…they keep them on a retractable leash and then become distracted by looking at something and the dogs wander and even relieve themselves in the stores and the owners just walk away and pretend it never happened! When we were checking out, somebody was cleaning up after a pug who had relieved himself. Ick! You certainly couldn’t be a “secret shopper” Summer. Er, you came out? Concats! Love that cat tree jungle! I would headed over there too! I don’t have nearly as much fun as you when I go shopping! 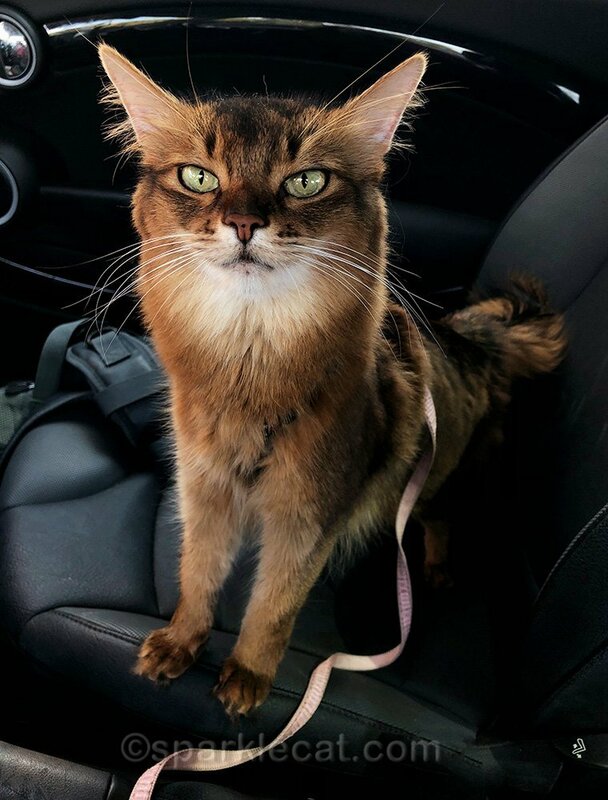 Looks like you had fun on your little outing, especially being able to certify that the cat furniture was cat friendly. I wish my kitties were as well-behaved as you are, Summer. I would not DARE to take any of them shopping. 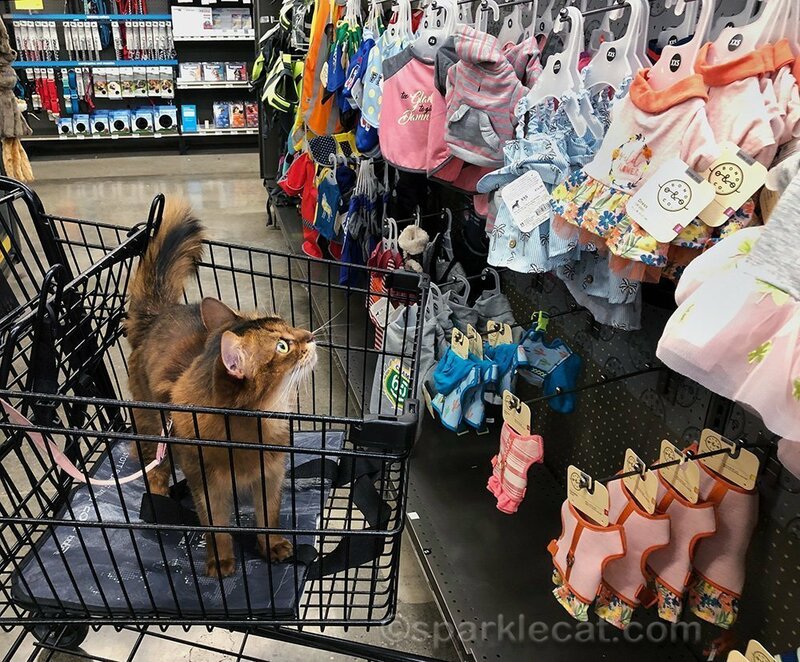 Does your human ever take Binga shopping? I am guessing that Boodie would not care to go out in public like that. Binga would definitely NOT be well-behaved so she stays home. You did such a great job testing out those products. You should be in every magazine, Summer! You are just too cute! It’s good when the mom lets you go shop too. As it should be. 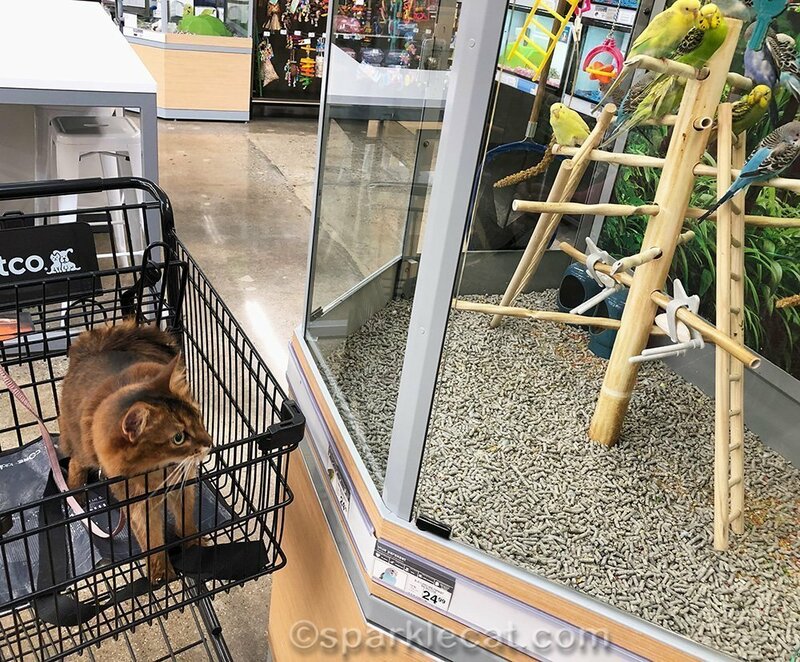 Some kitties might consider those parakeets to be cat food. You’re so lucky! You get to have so much fun! You always have some shopping fun sweet Summer! Well, bummer that they don’t have magazines (says a person who works for a magazine). i didn’t know parakeets could be so disrepectful. Wow, you’re even more famous than you thought you already were! It’s so cool that you got to roam around the store like that. That did look like fun checking out the cat trees. The store is lucky to have you “road test” it for them. Can your human email and ask to have a copy of the magazine sent if they are sold out? I have done that in the past with various publications that I really wanted. An email version is never quite the same! You’re definitely a shopping pro, Summer. We’re glad you had a fun time.